School pupils from Derbyshire and South Yorkshire have recently worked together to help generate ideas on how to attract more tourism to Stoney Middleton, a small Derbyshire village in the Peak District. 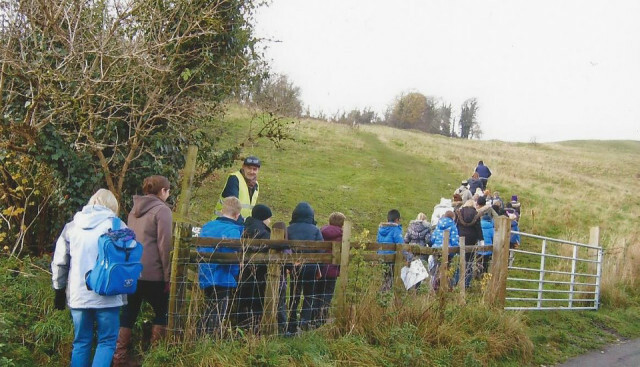 Over fifty school pupils were invited to visit the village, as part of a two day event organised by Sheffield Hallam University’s Venture Matrix team, to learn about it’s heritage and help develop new ideas on how to attract more tourism to the village. Despite it’s rich historical background, the village of Stoney Middleton has been somewhat overshadowed by events occurring in the neighbouring village of Eyam, which is well known for being the ‘plague village’, after an outbreak of the bubonic plague was reported there in 1665. This has led Stoney Middleton to become known as ‘The Forgotten Village’. The first day of the event saw pupils, aged between 8-11 years old, from several South Yorkshire and Derbyshire schools, being given a guided tour around the village, by members of the Stoney Middleton Heritage Centre Community Group. The pupils visited key historical sites within the village including a Roman Bath House, the Boundary Stone – relating to the 1665 plague – and Lover’s Leap, from which Hannah Baddeley is said to have jumped in 1762, but miraculously survived. The Venture Matrix team worked alongside members of the SMHCCG and the headteacher at the local primary school to develop activities which would bring to life the stories of the village to the school children. On the second day of the event, the pupils were given the opportunity to visit Sheffield Hallam University to build on their knowledge of ‘The Forgotten Village’ and work with a group of first year university students studying Business and IT to create ideas on how they would increase tourism to the Stoney Middleton area. The childrens Ideas ranged from seasonal activities, such as a ‘spook festival’ in the village at Halloween to a Lover’s Leap cliffside bungee jump experience. They then presented their ideas in front of a panel of judges, who considered how the ideas could be implemented in real life. The event was a great opportunity to help raise awareness of the Derbyshire village by involving younger generations and teaching them about why the village is so special. The event, which was planned and organised in conjunction with Sheffield Hallam University’s Venture Matrix scheme, which helps students to develop their employability skills through real life work-related projects that are accredited as part of their degree. The schools involved were – Wath Comprehensive, St Marys Catholic Primary, Stoney Middleton and West Melton primary. I have worked at Middleton Hall for 20 years when it was owned by Bill Glossop, previously known as The Old Hall Farm & I think before that Stoney Middleton Hall, there is lots of history to it as it was once owned by the Denman family & taking an interest in the history of Stoney Middleton have never seen anything mentioned about it or the octagonal church at the back of it in the Nook. We have just been reading these pages of history as The Grouse Inn was mentioned to my husband a few years ago & last week we actually found it. Looking forward to your reply.